The Investor perk allows you to invest 500 gold in certain merchants, after which that merchant will permanently have 500 more gold available. Some merchants are bugged -- they have the dialogue allowing you to pay them 500 gold, but doing so does not result in any permanent change in the merchant's available gold. These merchants are not checked in the "Invest" column in the following tables, but instead the bug is noted on the individual merchant page. Investing in a merchant improves that merchant's disposition towards you. † It is possible to invest endlessly with Angeline. She never loses the dialogue option to invest, but her permanent base gold cannot increase, due to a bug. Ghorza gra-Bagol will have the dialogue option to invest in her store, but the only option is to decline, due to a bug. * Hunters will not dissipate their wealth when you sell them things. They have theoretically unlimited wealth. It is just that they will only pay up to certain amount of gold for a single item, or a single stack of items. Merchants who are also Trainers add the gold you pay them for training to the gold they carry in their personal inventory. Since gold is never equipped, it becomes available to be used for bartering. Resetting the Speech perk tree using the Black Book Waking DreamsDB does not affect investments you may have previously made with merchants. 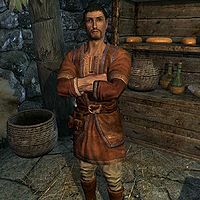 If you move your spouse to one of the homesteads added by the Hearthfire add-on, they will often wander around outside the house, where their merchant chest will not be available. To engage in trade with your spouse, wait until they go inside, or ask them to follow you if they are a follower and lead them inside. Esta página foi modificada pela última vez à(s) 20h15min de 17 de outubro de 2015.